We have a fleet of 150+ vehicles with saloon cars, traditional 5 seater London black cabs, 6,7 and 8 seaters. Providing a first class and professional Taxi service in Coventry. We are one of only 15 private hire licence holders in Coventry. Drivers’ credentials are important to us. 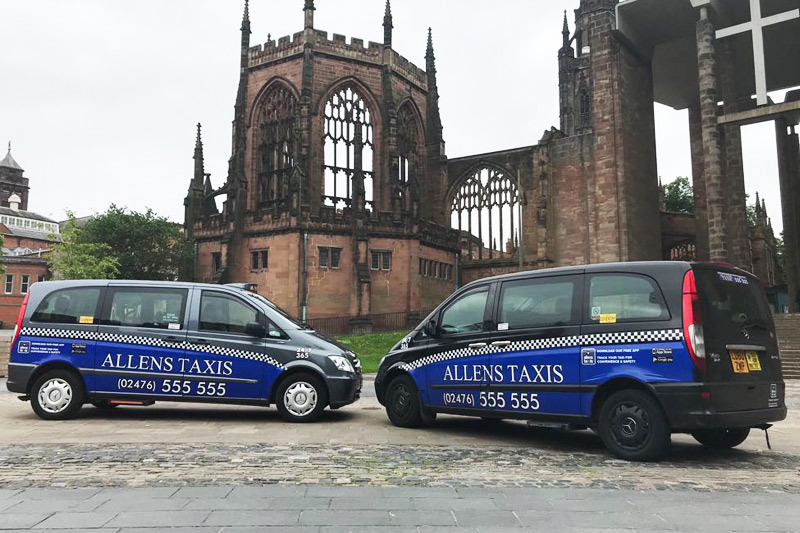 All our drivers are licenced through Coventry City Council Taxi Licencing Office (TLO). This means they are fully vetted by Coventry City Council in person, NOT ONLINE. Each driver’s credentials, passport, driving licence, driving history, criminal/convictions etc are checked and verified by the TLO. All Drivers have to undergo training in disability awareness and customer care, wheelchair assistance training and child sexual exploitation awareness training to ensure you receive the highest level of professionally trained service..
Every driver has to be assessed by the TLO on their communication and numeracy skills, road knowledge, driving skills, plus have a medical examination and of course any prior convictions are investigated and assessed. Once all these conditions are evaluated and deemed satisfactory, only then is a Coventry Licence granted. This badge then has to be renewed annually, again in person not online. All vehicles licenced in Coventry are also subject to stringent compliance testing before an annual inspection certificate is granted. Many vehicles working for online cyber or app based taxi companies are not subject to these laws/standards. Having both of these licences then enables our drivers to get fully insured for ‘hire & reward’ purposes. We hold copies of all our drivers and their vehicles documentation and ensure that all their compliance is up to date & they are operating legally. We do this so that you know when you get into an Allens Taxi it is safe and operating legally.